Does anyone have an explanation for this??? Yes, that is a nice example of the new printing by BCA -- conveniently IDed by the B11111 plate number! As you may have guessed, the slits are intentional. They are part of the "log/stack" packaging format, where 10 horizontal coil rolls are connected to each other vertically. The backing paper also has the slits. The postal clerk can easily "snap" off a roll or two or more to sell to the consumer. I wonder if this will spawn a new area in US stamps -- collecting vertical pairs of horizontal coils? You have to buy at least 2 coil rolls just to get one vertical pair or block. Unless you can use up all that postage, those kind of purchases are something a dealer would do and then resell all the remaining vertical pairs. 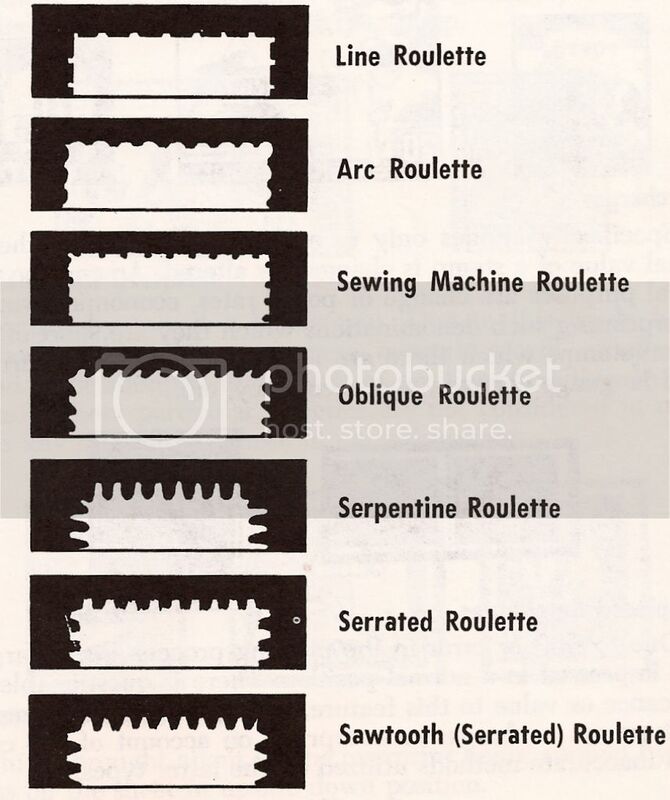 As for cost of collecting the Vertical Coil Pairs, you would have to spend $98 to buy two rolls. I buy a couple of thousand stamps each year for my business, so the cost would not prohibit me from purchasing a couple of connected rolls. I edited my original post to remove all references to Canadian coils, because the statements were not rigorously correct and would require too much explanation/pictures to make it accurate. Sorry about that. I was at a flea market yesterday afternoon, to see if there was anything stamp related. As usual, I didn't see anything, but did see some foreign banknotes, not that I actively collect them, I do have a few. As I were going through them, I seen one that was printed by the American Banknote Company. As many of you know, the American Banknote Company printed US stamps for many years. They also printed stamps for other countries, too. Well for only $2, I went ahead and bought it. What I was wondering is there a comprehensive website or book that list everything the American Banknote Company printed throughout the years??? Nice, no longer legal tender, but nice. I still have some of the older bills as well. Don't know of any website that comprehensively show ABN printings, but there is a catalog for bill currency. I did a mass mailing to all my clients at the beginning of the year. The cancellation is from New Orleans on January 3, 2017. Well the return labeled is dated February 21, 2017 and I received it in my PO Box today, February 25, 2017. Hmmmm..... where has this cover been sitting for the last 7 weeks, since the USPS couldnt figured out were it needed to go? The reason it was not deliverable, not that I had wrote the wrong address, but the Zip Code was partially blocked in the clear window of the cover. I removed the yellow sticker and tapped the envelope on its side, and guess what? I could now see the Zip Code. Guess that was to much work for someone at the post office. In your case, I was tempted to envision a postal employee staring at your envelope window for 6 weeks, trying to figure out how to move the contents without opening the mail so they could determine the address. Hey Chris, what are some good Flea Markets to go to in New Orleans? Every once in awhile I go to New Orleans to check out the Flea Market/Antique Scene. I've only found a couple I just know there has got some I'm missing. I've been told to steer clear of Magazine Street and the French Quarter though. Yes, I've been there. I actually bought an old book published in 1968 on the old American Football League last time i was there. Use it for one of my websites I have. And I agree. The old dude in there seemed pretty uptight. It's actually not far from the neighborhood I lived in until I was about 10. I've also been that one on ..... Jefferson, I think it is. In Harahan right next to the Blue Tomato. The little dude in there talked my ear off. And I usually hit that big one on Airline when I'm in town. There's actually quite a few around me in the Lafayette area. As a matter of fact I went to a couple yesterday. One is an old department store that was converted and the other is an old schoolground. The gym is just crammed full of vendors and the main building is at least 20 school rooms full of stuff. I got to say. The flea market vendors around here are usually very friendly. I rarely ever find anything stamp related. I did find an old album not long ago. A Minkus "World Wide" Album. Hard cover, not in too bad a shape. Didn't have much in it. So I decided to try to fill it up with as many duplicates I could and sell it on Ebay. Yeah, there are faults with the pricing too. The 2017 Scott value for hinged is now $600. And if it's >$15 then it's too expensive even for a space filler. Who am I to criticize? It's probably better than the one I have! Dont know if many of you all know, but Linn's Stamp News has a weekly magazine that is full of neat articles, new stamp issues, upcoming shows, stamp classifieds in the back, etc. Well I decided to try out one of the sellers and sent off $6.95 for 1000 WW stamps (thats less than a penny a stamp, so what did I have to lose). Well that was over 2 weeks ago and I was thinking either it got lost in the mail or the seller ran off with my money. Today I received the package. The highlight is the Souvenir sheet from Belgium. What a beautiful stamp and the CV is $1, just for that one stamp. Well there are a lot of CTO stamps, many from Romania, Hungary and Russia. Didn't see any wallpaper stamps, which I was surprised. The stamps were a mixture of used and mint and I didn't see any damaged stamps. Also I was shocked to see very little duplication. For the most part, the stamps were issued between the 60's and 90's. Since I collect mainly pre 1950, there weren't many stamps before then. Oh well, I will add the rest to the lottery prize bin. Also the seller sent a list of other stuff that he is selling, mostly by countries and a few topics. I will have to check that out. Has anyone else answered some type of classified ad and what was your opinion about what you received??? I used to do that a couple times each year up to about 15 years ago. It was sort of a hit/miss kind of thing, but most of the results were pretty good in general if you are careful about which ones you go after. I usually went after the "all-different" no minimum catalog stamp offers. The best ones I ever got were from one advertiser of 100 all-different "older" stamps for $1 and SASE. I had been expecting mostly common old definitives. To my surprise, it was a pretty high-quality mix of older stamps, most of which cataloged for >50c, with roughly 1/4 of them cataloging for $1+ (even one or two $10+). Almost all were sound. When I asked him about it, he said it was the remainder from a large bulk lot of on-paper stamps he got from a retiring dealer. He was simply soaking off the stamps and packing them into 100s for fun, and didn't care about catalog value. I ended up getting a couple more from him before he ran out. The total catalog value for each batch of 100 I had gotten from him was pretty consistently $100+ (I think the lowest was something like $95 or $98). <2% catalog value for a small batch of all-different mostly fault-free with no minimum catalog value stamps is very hard to beat. I assume that retiring dealer must have weeded out the minimum catalog value and damaged stamps while preparing the kiloware. A few other better small lots (<10% catalog) I got tended to have a couple of high denomination modern definitives that bumped up the total catalog value of the lots. Sometimes the seller would use them to seed batches of very common stamps. Over the years, I noticed that those high value definitives tended to always be from a few dozen possibilities, so I quit buying those lots. The sellers were basically spicing up their small lots using the same bulk high-value source. It was easier to simply buy bulk batches of premium stamps. I could then pick the grade/condition I wanted. But it was a lot of fun sending off for those small mixtures, even if sometimes they weren't super. Now I just don't have the time. Also, I never had one lost or one that didn't meet the advertised description. Medium-sized to large lots from business advertisers are a different story. I thought they would be safer but I was wrong. I got into an argument with one advertiser ($100 box lot). The lot I received contained less than 60% of what was advertised, and that counts in my generous inclusion of 20%+ "bogus stamps" that aren't listed in ANY catalog. In addition, 25% of the stamps were bulk packs of 100-alike very common European definitives -- the kind that wholesale for 2c-5c for a pack of 100! I had expected duplication, but the amount of duplication and the junk was shocking. The seller retorted that in decades of selling and hundreds of boxlots they never had anything like this happen including 40% short in stamps. To which I replied, in decades of buying, I never had a seller short me by so much. They refunded my purchase price, less shipping, and I had to pay to send the box back. So basically I was out $15. Needless to say, I never bought from them again. I was at the post office on Monday, waiting in line for my turn and overheard the USPS employee tell a customer that she will have to mail her box via UPS.... WTH!!! The lady that was trying to mail the box was an older lady and the box couldnt have been heavy by the way she was handling it. The approximate dimensions of the box were 24"x24"x6", which was not an abnormal huge box. I dont know where the box was being mailed to, maybe that had something to do with it. The lady was appalled and I couldnt believe it either. Am I missing something here?? ?